This can be your Conference Room. When you want more for your business, look for Moore. Moore County, in the heart of North Carolina. Pinehurst is an international address. It can be yours. … has the building or site, workforce, infrastructure and resources to accommodate your company’s start-up, relocation or expansion needs. We welcome business and industry that compliments the exceptional quality of life we enjoy here. Our desirable location in central North Carolina, combined with many other advantages such as impressive schools, a “job-ready” workforce, and one of the lowest property tax rates in the state, creates the right mix for business success. And it doesn’t hurt that Moore County is the Home of American Golf boasting almost 40 premier golf courses. It’s no secret that the links can be a venue for doing business. We invite you to take a closer look. 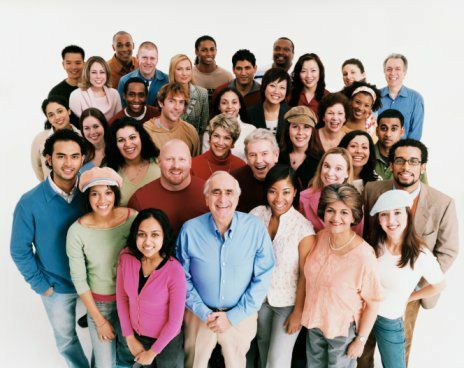 We’re confident that Moore County will meet your needs, whatever your lifestyle preferences and business goals may be. 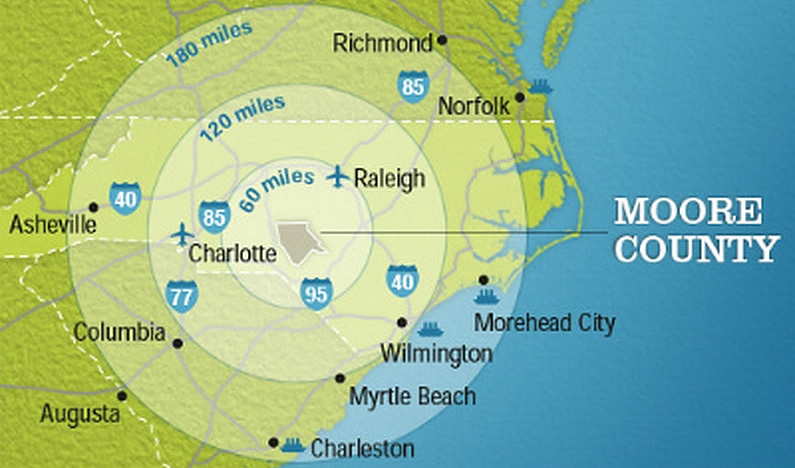 North Carolina is halfway between New York and Florida and affords easy access to Eastern Seaboard markets. 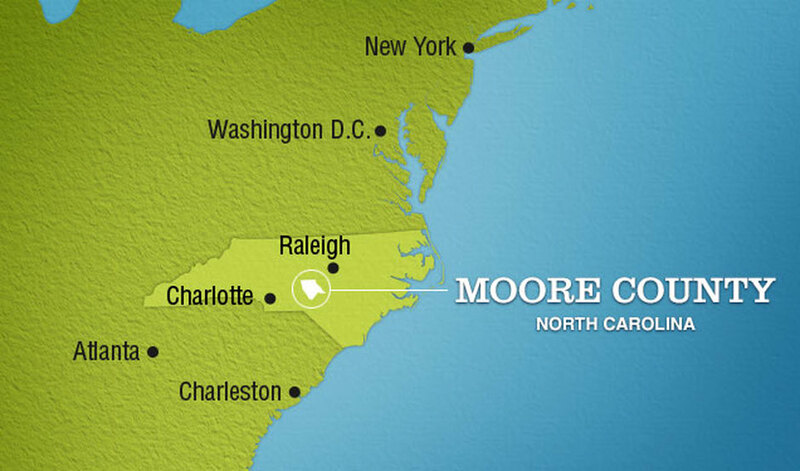 Moore County covers almost 700 square miles of land area in central North Carolina in the region known as the “Sandhills”. 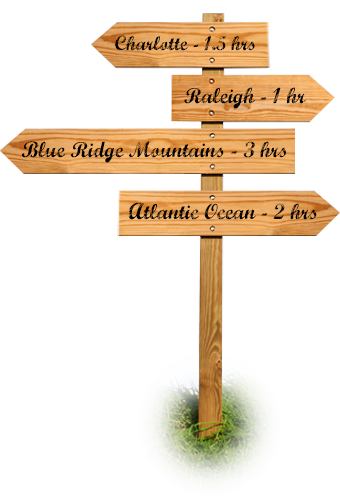 We are halfway between the mountains and the coast, and just an hour’s drive from the Research Triangle Park and Raleigh-Durham International Airport. We can conveniently access interstate highways, international airports, major universities, and other resources in the Raleigh-Durham area, the Piedmont Triad area, and Fayetteville, but still enjoy a less hectic way of life. Residents appreciate Moore County’s mix of small town living and big city amenities – the best of both worlds. Moore County’s location next to the Fort Bragg Army /Pope Air Field military installations also offers unique advantages. 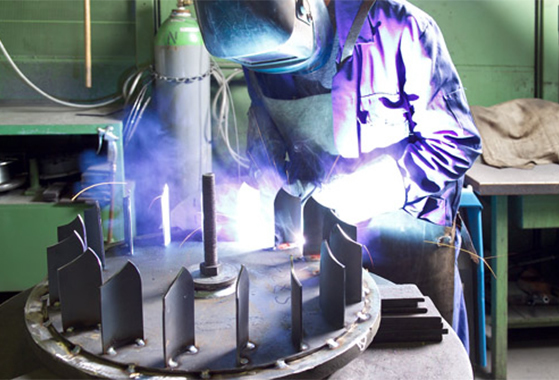 With these installations adjacent to our southeastern border, Moore County benefits from their economic impact without the military environment affecting our lifestyle here. This proximity makes us an ideal location for defense-related companies. 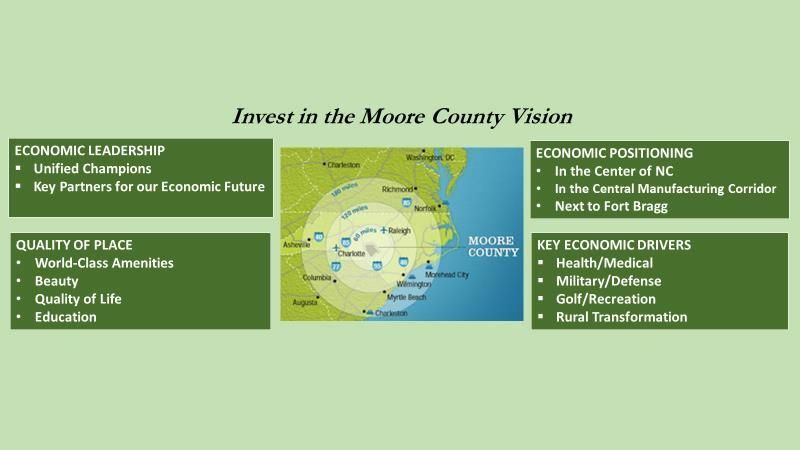 Moore County’s 2018 population estimate is 99,310 and is projected to be over 125,000 by 2035. 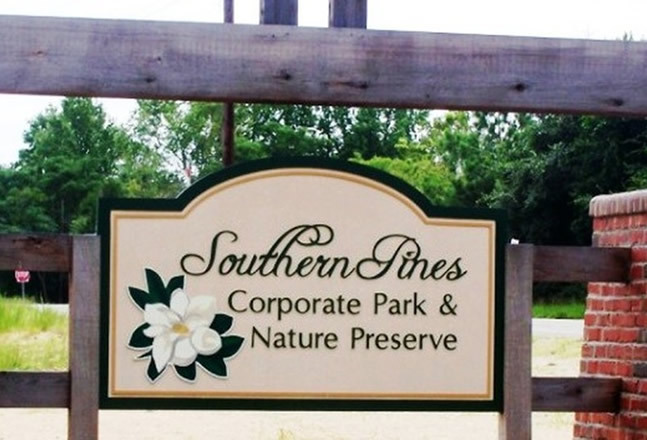 Moore County has a variety of buildings and sites to accommodate your needs. Moore County’s labor force has the job-ready skills and dedicated work ethic to meet your workforce needs. Moore County has to offer.